SteelSeries, the leading manufacturer of premium-quality, gaming peripherals and Electronic Arts Inc., the world’s leading mobile games publisher, today introduced the Real Racing™ 3 Gaming Headset. Its incredible sound takes the mobile racing experience to the next level. “EA is the leading publisher of the world’s biggest iOS and Android games and we’re proud to partner with one of their most recognized mobile game franchises,” said Bruce Hawver, SteelSeries CEO. SteelSeries, the leading manufacturer of premium-quality, gaming peripherals and Electronic Arts Inc., the world’s leading mobile games publisher, today introduced the Real Racing™ 3 Gaming Headset. The slim-profile, on-ear headset was chosen for its lightweight, comfortable and portable design allowing gamers to take the complete racing experience on the road. Its loud and clear sound is powered through 40mm driver units, picking up the low tones and deep bass for the game’s soundtrack and the high tones of approaching cars, gear shifts, and screeching tires. The all-white headset showcases stylish, glossy ear plates with a chrome-colored game logo and speedometer design. Featuring an adjustable, FluidFIT headband they are also outfitted with SteelSeries’ sound isolating, SNDBlock ear cushions created with a breathable, mesh-cloth material. Designed for maximum portability, the headset can fold up and each earcup can be rotated flat for easy storage or to comfortably show it off around the user’s neck. The Real Racing 3 Headset comes equipped with 2 cable options, one for PC and the other for Mac and mobile devices, both with an in-line microphone. Additional features include 2 input jacks, one on each earcup, allowing users to choose which side the microphone cable can be plugged. The remaining input jack can also be used to share sound by simply plugging another headset into the Real Racing 3 Headset so that multiple users can listen to the same device. 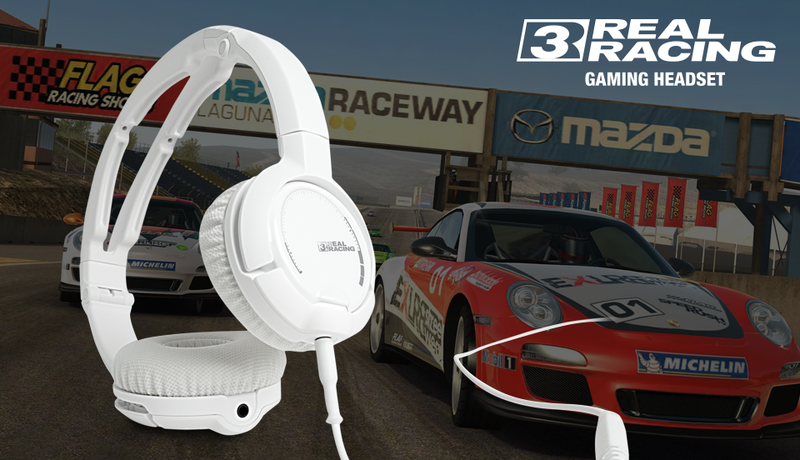 Available now online in the SteelSeries Web Shop, the Real Racing 3 Gaming Headset is $99.99/€99.99 MSRP. For more information, about the headset check out http://steelseries.com/rr3 and be sure to follow SteelSeries on Facebook and Twitter for the latest news, contests and promotions surrounding these products.